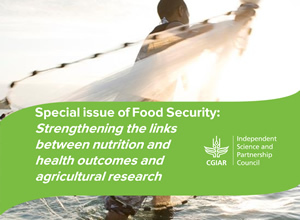 "Strengthening the Links Between Nutrition and Health Outcomes and Agricultural Research"
The June 2015 issue of the journal Food Security includes a special section: "Strengthening the links between nutrition and health outcomes and agricultural research." This collection of papers advances the boundaries of the field of agri-health research beyond farming households, and toward markets and food systems. In this month's Ag2Nut call, the section was disseminated to the Ag2Nut community. Participants heard about the special section as a whole, including short presentations of three of the papers. 1. Overview of the special section (Co-editors Maggie Gill and Anna Herforth).